This Wi-Fi security camera from Motorola offers cloud-based monitoring via your smartphone, tablet or computer. 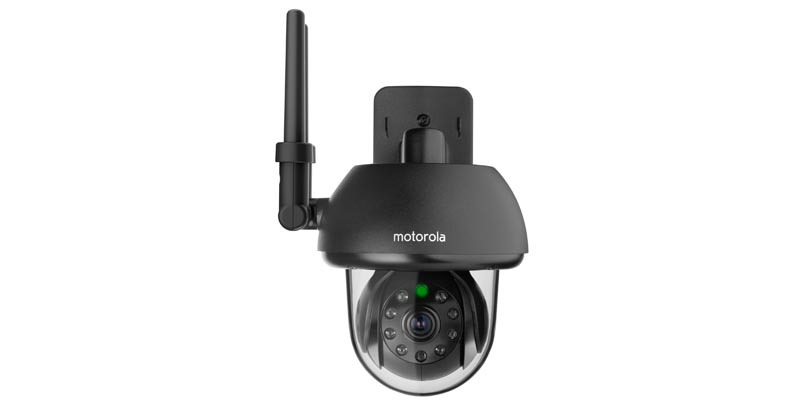 If you need to keep an eye on your home, whether to check on your pets or if you are concerned about the security of the property itself, then the Motorola Focus 73 Connect wireless camera offers peace of mind with a 270 degree view with pan and tilt control to closely monitor the area of the house you’ve installed it in. This Wi-Fi camera sends motion and sound notifications to your smartphone or tablet so you can monitor and stay in touch with what’s happening at home from wherever you may be. You can capture videos at night or in low light levels thanks to built-in infra-red night vision for true effective 24/7 monitoring capabilities. This camera was designed for outdoor use so features a robust weatherproof casing that will ensure reliable performance even with the worst of the weather. This camera is effectively a low cost private surveillance system that’s easy to install and use. The camera is wall or ceiling mountable and works equally well indoors or outdoors, it can record and stream video with a 720 pixel resolution (streaming to your smartphone at 12 to 15 fps). easy to monitor with the Motorola Focus 73 Connect HD WiFi Home Security Camera. The CMOS sensor and infra-red LED’s allow good night vision viewing at up to 3 metres and video can be recorded in FLV format for Android (not available in iOS devices). The camera is compact at 195mm x 130mm x 153mm and weighs just 1.5 kg. DIY installation is straightforward and the box contains everything you need including power adapter, splitter for network cable, wall mounting screws, wall plugs, plus user and quick start guide.